When working with Git on the command line, I spend a lot of time switching back and forth between two branches. Even with Git tab completion, it is a lot of typing. However Git has a shortcut for the previous branch, a single dash (-). By default Vim is the editor used when writing a Git commit message. While I love Vim, it does work very differently than most other editors. A good option for those who are not comfortable with Vim, is to use a different editor. This is how to setup Git to use a different editor. I do most of my work in Vim (or Neovim) in tmux inside of iTerm on my Mac. I found my color schemes were being properly applied in Neovim but not in Vim (version 8). Adding two lines to my .vimrc corrected the problem for me. 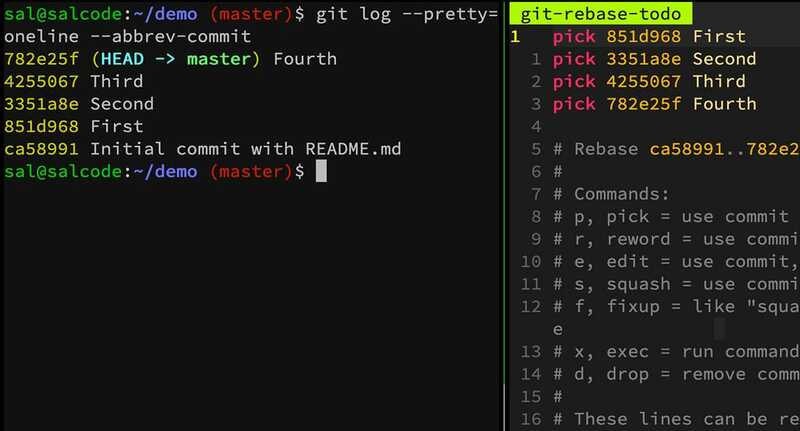 The interactive rebase feature of Git is one of my favorites. I love being able to squash multiple commits into one commit or re-order my commits for clarity. My one complaint is the Git interactive rebase commit order is wrong (at least for the way my brain works). I recently updated my copy of OS X to Mojave and I’m now having trouble with SSH. (I jumped a few versions but based on other posts it looks like the change to MacOS Sierra specifically was part of the problem). When using Git, sometimes (often) I find myself forgetting to delete local branches after merging them. This command deletes this branches (and I’ve included a Git alias to make it easy to use in the future). These are the steps I follow when I move the database for a website to my local computer using WP CLI. When working on my Mac, sometimes I find a process in Activity Monitor and I want to know what application the process belongs to. I was introduced to this command to do just that.